I am a person who like to think of creative ways to eat food. Especially the foods that I could definitely use more in my body but aren’t exactly a huge fan of. Take broccoli for instance. I am not a broccoli fan but smother it in nacho cheese and butter and you can bet that I am a huge fan right there. Although it may not be the healthiest thing in the world I am getting my broccoli in… am I right? What about you? Is there a food that you could definitely eat more of if it just tasted better? So when the idea of a broccoli crunch salad came to mind, it sounded pretty good to me. Put a lot of veggies that I like in a mixture and stir in some delicious dressing… I was so totally in love with it in my mind. I always bought this broccoli slaw pre-made and it tasted pretty good, but I wanted something better. So I set off to make my own of course. Eight recipes later and I have literally found the perfect one! 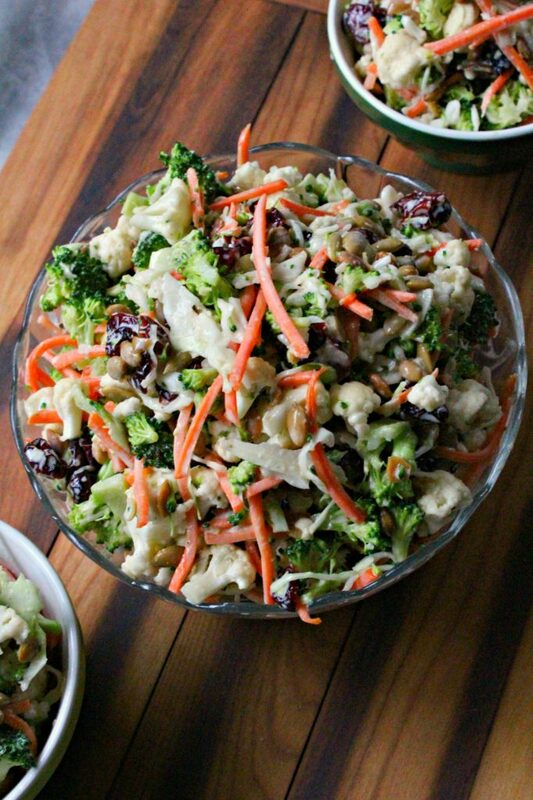 Mix together your broccoli, coleslaw mix, cauliflower, carrots, nuts, and cranberries all together. Mix in the onion if you would like. mix together your dressing ingredients. pour dressing over the broccoli mixture and stir until well incorporated. Serve up this delicious salad as a side or topping. I still cannot believe how amazing this salad is. I have been making it about once every two weeks because well lets face it I am addicted to it. This broccoli crunch salad is great by it self as well as incorporated into other things. We like to put it on top of burgers, BBQ sliders, in tacos the possibilities are endless with this broccoli crunch salad. The broccoli crunch salad recipe is such a simple and good recipe and works with just about any diet. The avocado mayo just gives the taste an added dimension, but the lemon dressing is still good with a regular mayo. I recently found out that there is vegan mayo! I was literally shocked for some reason. I tried it and I have to say it is pretty good. 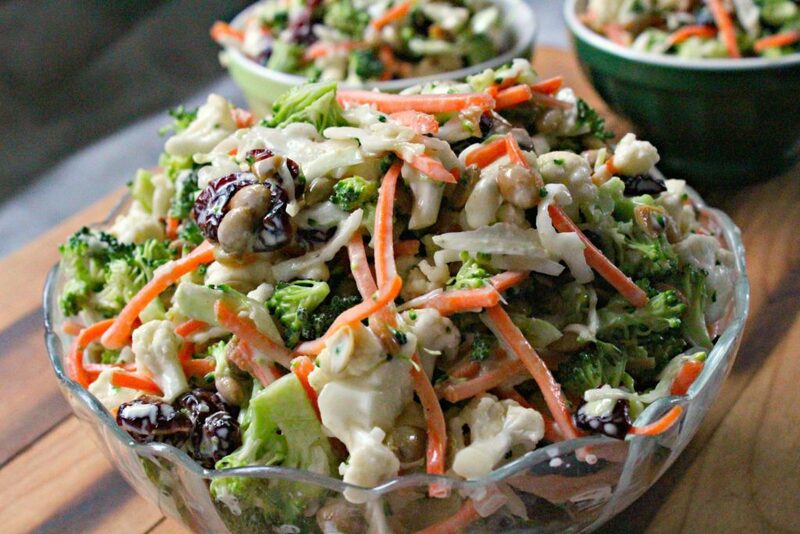 As far as the nuts or seeds in this broccoli crunch salad, you can be creative here. What do you have on hand? I have used pecans, walnuts, sunflower seeds and almonds and they all give me the nuttiness I needed for the salad. And the cranberries are a must. 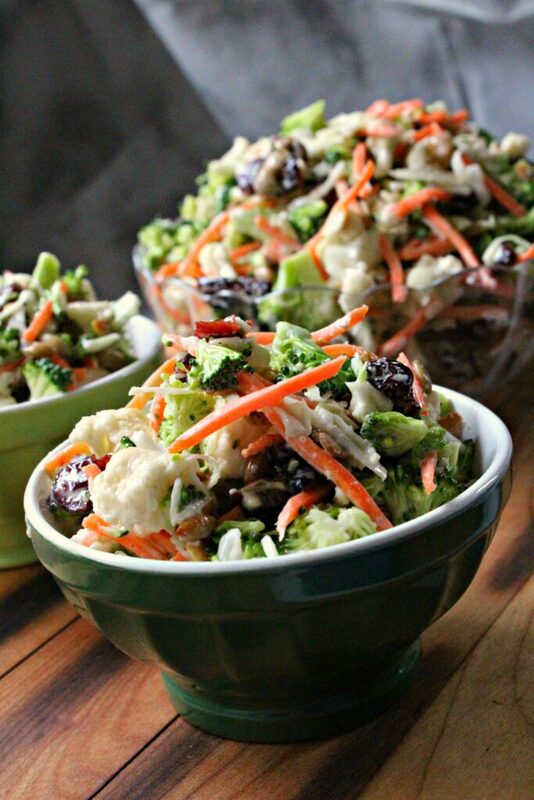 Raisins did not do it for me in this salad but you can definitely get creative here! How do you start a New Year? Me? I start a new year with muffins. Why you ask? Because they are muffins! How can you seriously go wrong with them? 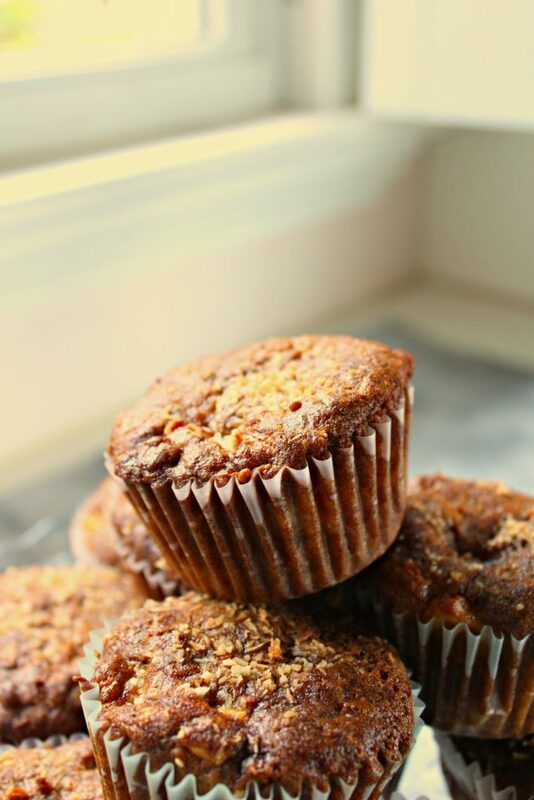 Especially when they are secretly full of antioxidants and plenty of good stuff like these Morning Glory Muffins! Every morning I have to eat breakfast and usually it is sitting at my desk with oatmeal, a frozen breakfast sandwich of some kind or a muffin (Not always homemade sadly). My point is I have to make time for breakfast and I need to make sure that it makes me full too. That is the hard part since in the morning I am always starving. 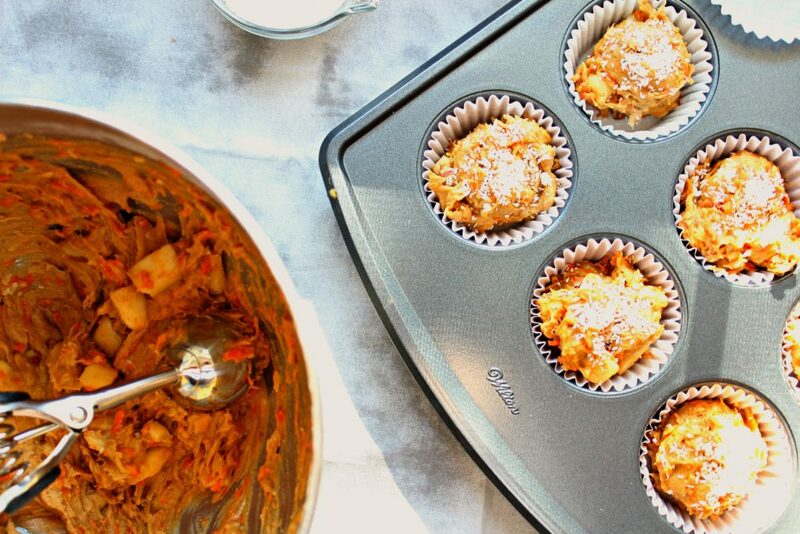 These morning glory muffins are the key since they have protein, antioxidants, veggies, fruits and fiber galore to keep you burning through the day. I know that they really help me out. Preheat oven to 350 degrees Fahrenheit. Mix together your flour, starch, protein powder and xanthan gum. Sift once and then add in salt and cinnamon. Set aside. Mix together sugars, eggs and oil until combined. Add in vanilla, carrot, 1/4 cup coconut and apple. Let sit for a minute to let the apple combine with the sugars. Then add in your flour mixture slowly. Stir in your nuts and raisins. I like to add in some chocolate chips from time to time to mix it up a bit. Fill the wells of a muffin tin (sprayed with non-stick spray or with cupcake liners for easy clean up) about 3/4 full. Bake 20-25 minutes or until a toothpick comes out clean. Enjoy warm with a cup of coffee or as dessert! 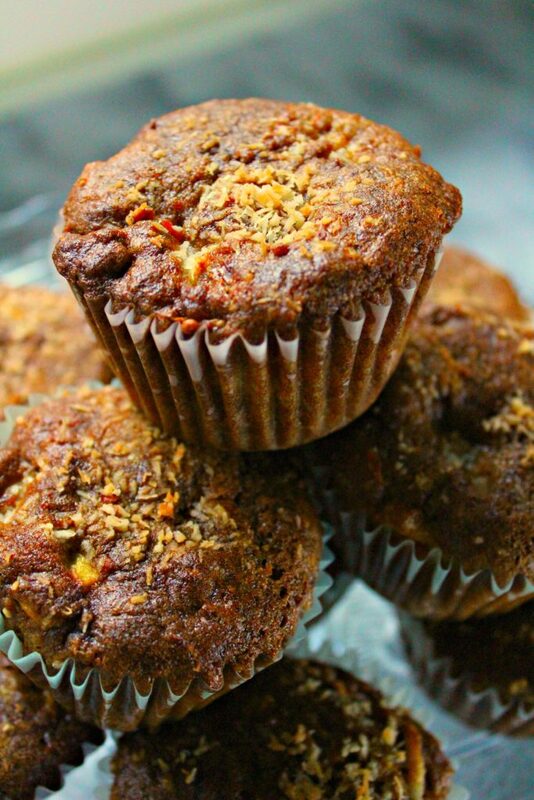 I am simply obsessed with this morning glory muffins and all the nutrients that they come with. I can’t even begin to describe the luscious taste they have. They are so filling with the protein powder but they can be totally customized to your taste. Adding in a vanilla protein will give you a more vanilla-y taste and that is when I like to add the chocolate chips to break it up a tiny bit. 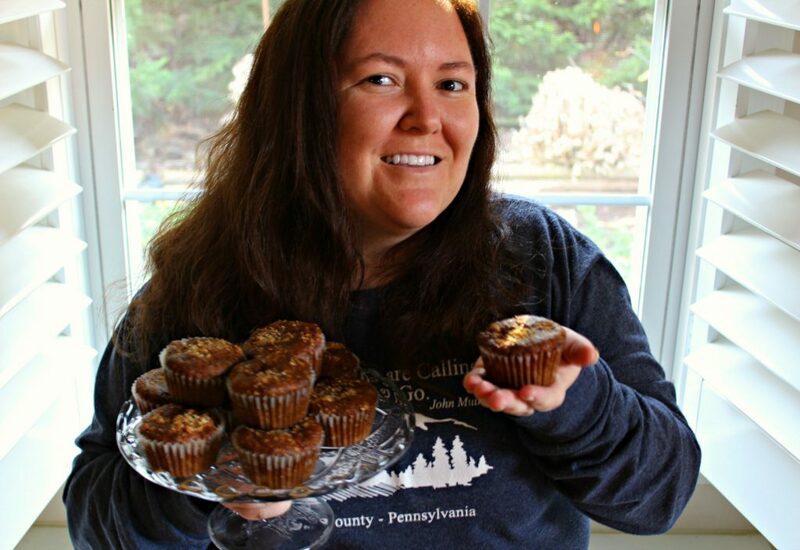 That and the chocolate chips just give this muffin a little more dimension as well. The protein powder is completely optional. You can add more just take away more tapioca starch. Be sure not to take all the tapioca starch away. Another way to spice of these lovely morning glory muffins is to have as a side for dinner. Here in the south every one is obsessed with bread as a side dish. I personally have found my people since I am a breadaholic (It is so hard to be gluten free here!). But these you can’t even tell they are gluten free because they are just too amazing! Happy Monday all! I hope everyone has had an awesome weekend! Cannot wait to see what you link up this week! Have fun! Happy Monday all! Happy linking! 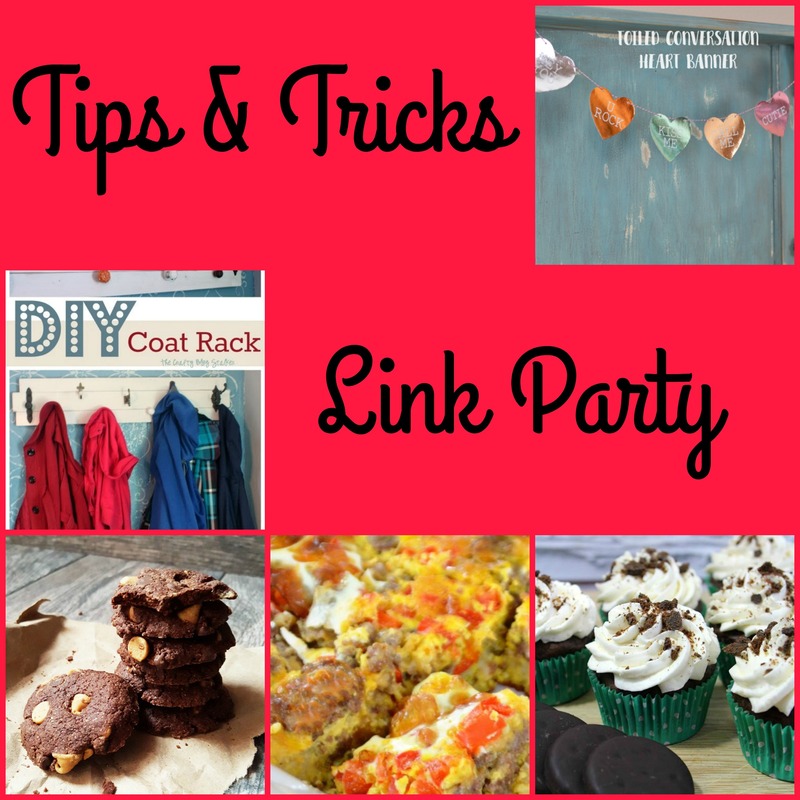 Welcome to the Tips and Tricks Link Party! Don’t forget to sign up for the AMAZON GIFT CARD GIVEAWAY!! Happy Monday! Hope you all are doing well!